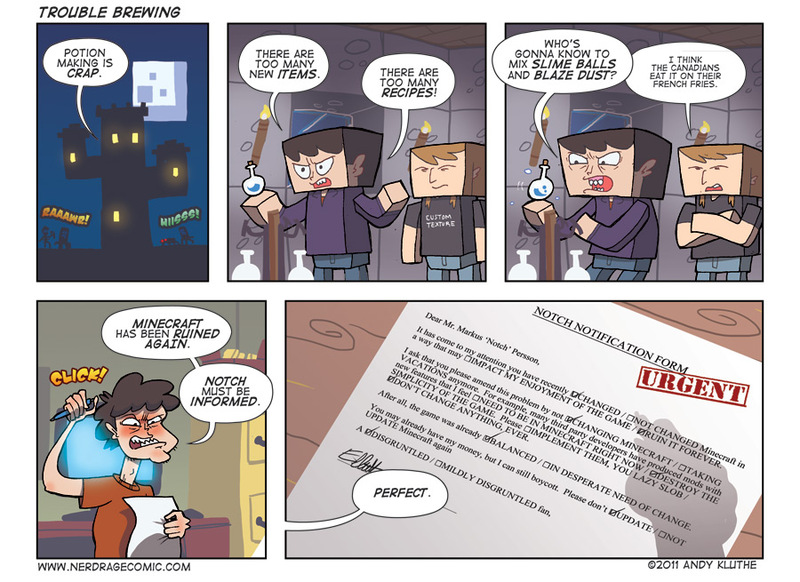 There's always a lot of talk when Minecraft updates. Or doesn't update. If someone isn't complaining about the lack of updates, they're angry that the changes have taken it to far. After all, who wants leveling and experience in Minecraft? This isn't a game about endless grinding, resource hunting, or fighting monsters, zombies, and skeletons! While I approach some of Minecraft's newer additions with caution, I have faith Mojang will have everything working smooth by release. In other Mojang-related news, Scrolls will remain Scrolls. Pokemon Black, Pokemon White...what's the obvious next step? Pokemon Gray, I guess. The name alone sounds...bland. But it's Pokemon, so it doesn't really matter. Excited for Uncharted 3? No? Japan thinks you should be. Or at least thinks you'll believe Harrison Ford is excited. Or maybe not you specifically, but they think someone will believe it. Maybe you should just watch the trailer. Last weekend was NYCC. Hasbro was there. They sold comics of this. It can only be described as a mishmash of every un-used Hasbro property stuffed into one book.